N'Ukefest returns! 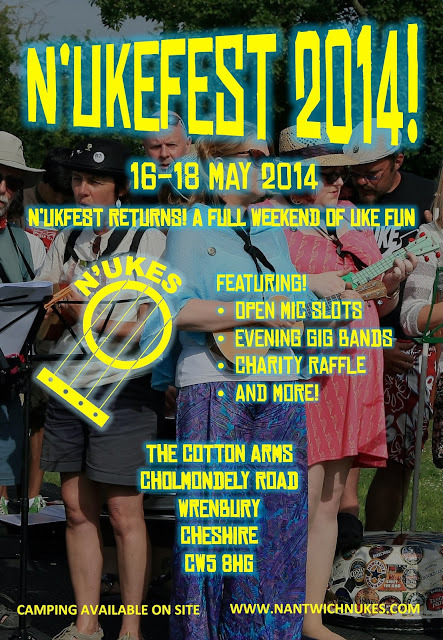 Another weekend of ukulele fun for enthusiasts or just the uke curious has been booked of 16-18 May 2014, in the heart of the Cheshire countryside. Following on from the success of the 2013 gathering, we listened to feedback and hope to provide more of the same only better! It takes place at the Cotton Arms pub, Wrenbury Cheshire and is free to attend. The whole weekend is in aid of Charity (Macmillan Cancer Support and The Wingate Centre) and aims to be an informal get together of old friends and new with a shared love of the ukulele. Things kick off informally on the Friday evening with a get together and a jam. Saturday daytime will give you the opportunity to take a spot on the open mic stage that is running all day and in the evening there will be performances from pro and semi pro ukulele acts until late. More open mics on the Sunday day time also. There will be other surprises too that we are still working on, plus kids activities, food and a superb charity raffle being organised by Mary Agnes Krell - and if that is anything like last years, it promises to be amazing. Best of all, you can book camping direct with the pub (or caravan pitches) if you want to stay over and enjoy the full weekend! We are keeping the site http://www.nukefest.com up to date with developments, so keep that page bookmarked! We hope to see you there!! SAVE THE DATE! !